Martin Luther King, Jr. did not make the civil rights movement. As Elizabeth Myer Boulton reminds us, it was the movement that made the man. Without the movement there would have been no “I Have a Dream Speech”. Elizabeth (Liz) Myer Boulton’s spouse, Matthew Myer Boulton, President of Christian Theological Seminary, hosted five McCormick Theological Seminary classmates this past week, including Steve Shoemaker and me. I returned from Indianapolis and found Liz’s powerful sermon. It reminded me of Kay and my month in Saint Augustine. It was the unsung local heroes who built the movement, paid the price, and drove the buses to the Poor People’s March on Washington. Martin represented them all. – Gordon C. Stewart, Chaska, MN, May 23, 2015. A month in America’s oldest city, St. Augustine, Florida, makes clear that history is a strange thing. History is the past, but it’s also the telling of it, the renderings of it. The English language does not distinguish between the two – the past as it was – and the past as remembered and interpreted. Only the interpreted past is available to us. Historians distinguish between the two with the word ‘history’ (the past) and ‘historiography’, defined by the Oxford Dictionary as “the study of historical writings or the writing of history”. Most interesting during our one-month stay in St. Augustine were the different historiographies of the Civil Rights Movement. 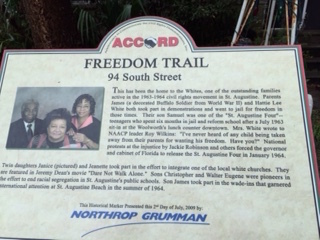 Tourists in St. Augustine walk past homes and churches with plaques like this one that tell the story of the brave civil rights history of the ’50s and ’60s on what’s called The Freedom Trail. The casual tourist is unlikely to notice that the Freedom Trail story is not the only one in town. There are two different sets of plaques. The groups that wrote and erected them represent different, often competing, historiographies. The more prominent set of plaques the define The Freedom Trail were created by ACCORD. They highlight the role of the Rev. Dr. Martin Luther King, Jr. and the Southern Christian Leadership Conference. The other is the project of a group of local citizens led by the Eubanks family, whose father, the Rev. Goldie M. Eubanks, Sr, was Vice President of the St. Augustine Chapter of the National Association for the Advancement of Colored People (NAACP), whose work predated and continued after the arrival of Dr. King and the SCLC in St. Augustine. The NAACP is the oldest civil rights organization in America. In the 1950s and ’60s, many civil rights leaders came to regard it as too passive, too conservative. The word ‘Colored’ in its name labelled it as out of touch with Back pride. The Rev. Dr. Martin Luther King, Jr. and the Southern Christian Leadership Conference (SCLC) arose as a bolder, more activist organization, although the the SCLC and the NAACP represented by Dr. King and Roy Wilkins, respectively, worked closely together. 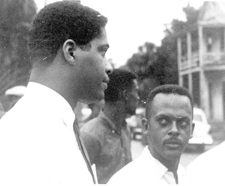 To the left of SCLC, the Student Nonviolent Coordinating Committee (SNCC), the Congress on Racial Equality (CORE), arrived on the national scene. While in St. Augustine, we lived next door to a home on The Freedom Trail identified by ACCORD as important to the Movement in St. Augustine. Some of the men who gathered there every mid-morning until dark seem to identify with Dr. King and the SCLC. Others seem resentful that Dr. King and the SCLC got the praise for the work of Rev. Eubanks, Rev. Thomas, and Dr. Robert Hayling, a courageous local dentist, who paved the way for national media attention to the plight in St. Augustine. The historiography of the latter group is posted on the alternative plaques that focus more on the indigenous leaders who put their lives on the line every day as citizens of St. Augustine. History and historiography are like that. The four Gospels of the New Testament look at the same time period and events with different memories and different angles on the Jesus story. The nature of history is that it always leaves itself to interpretation. And the nature of historiography is that it raises the question of the story-teller’s angle. In light of Dr. King’s later speeches about the intrinsic connection between capitalism, the War in Vietnam, and militarism, it seems a great paradox that it was the Northrop Grumman Corporation, one of the largest Department of Defense contractors, that funded the ACCORD project centered on Dr. King. History and historiography are always strange. Always they involve some concoction of our better selves, self-interest, pride, and sometimes, a heavy dose of irony. The men gather late in front of the house every morning before the resident gets up. Mostly in their 60s and early 70s, they arrive on bicycles or on foot with paper bags scrunched close at the top. The minority, the younger ones in their 20s, don’t use bags. They don’t hide the beer can or the pint. They pull the cheap, green, plastic chairs from the yard out to the sidewalk to start the day. The older ones survived the St. Augustine Civil Rights Movement of the early 60s and the violent reaction of the white city fathers of St. Augustine to the passage of the Civil Rights Act. They tell stories. The younger men don’t seem to care. I walk next door most every day to say hello. The conversations become windows into humanity, disparate perspectives, and history itself. Why did the once young men who waded in at Butler Beach in 1964, survived the fire bombing of their homes and the beatings by theKu Klux Klan end up here bleary-eyed with paper bags? They grow louder as the day wears on. One of them stands in the middle of the street blocking traffic as if to say to passersby, “This is OUR neighborhood!” Several times a day a car pulls up to the curb, opens the window, and exchanges something with the men. They disappear, one by one, into the house for a time. “Well, yes. Sort of..,” I smile, “more or less reverent.” We enjoy a good laugh. The Civil Rights Movement survivors recall how some of their classmates got out of town and left them behind. One of them owns upscale hotels in Atlanta and Miami. He comes home in his big Mercedes every five years or so. According to the men next door, he and others who got out look down their noses at the shrimp boat workers who lived hand-to-mouth existences in the old neighborhood where they grew up together. The Civil Rights Movement in St. Augustine is still a matter of debate both among its veterans and among the young men who have no living memory of it. For young and old alike, the men who gather daily next door are a community to each other. They have taken their “place” in the post Civil Rights Movement era of St. Augustine. They are part of America’s left behind. They’re going nowhere their feet or bicycles can’t take them. They care about each other. They are without pretense. They have each other, old friends and younger ones who are going nowhere. They are a local chapter of the community of the stuck. Their numbers are growing all across America. 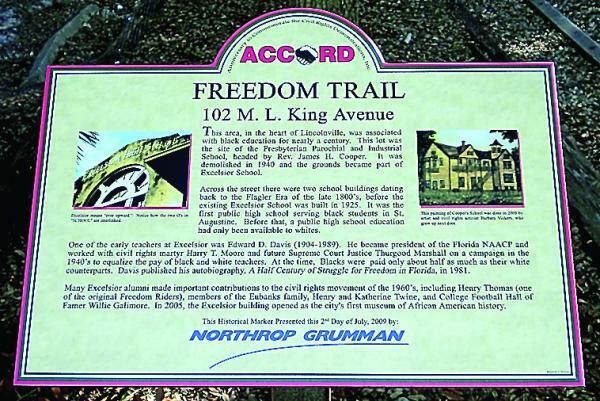 INTRODUCTION: Views from the Edge‘s earlier post from 40th ACCORD referred the KKK kidnapping of four civil rights activists in St. Augustine, FL. Yesterday Francis (“Tate”) Floyd said otherwise. Below is more complete information posted by The St. Augustine Record on May 17 , 2014 by Matt Soerge. “Views from the Edge” has added the bolded print and photographs to the text. In 1964 St. Augustine, Purcell Conway, a black 15-year-old, held hands with a white nun during a civil-rights demonstration that drew the angry attention of a white mob from the Ancient City and beyond. The mob surged forward. Conway was attacked, and so was the nun. They tore off her headdress. They dragged her to the ground by her hair. They kicked her. Fifty years later, the memory is still clear: How can people be so cruel, so petty? he asks, How silly, he says, that there is so much hate over the color of one’s skin. Conway traveled Wednesday to Tallahassee, where he reunited with other activists from what he calls the “teenage rebellion” — the civil rights demonstrations that rocked St. Augustine from 1963 until the summer of 1964, when the Civil Rights Act became law. They went to the Capitol building to see Robert B. Hayling inducted into the Florida Civil Rights Hall of Fame. His portrait will go up there along with those of the other inductees, the late James Weldon Johnson and A. Philip Randolph, both of whom grew up in Jacksonville. Hayling, 84, still sharp and witty, was a dentist who inspired and led the youthful demonstrators in St. Augustine. Now in their late 60s and early 70s, most of them grew up together in the largely black neighborhoods of Lincolnville and West Augustine. Asked to describe the St. Augustine of his youth, Shed Dawson, who was arrested nine times, gave a long pause before speaking. 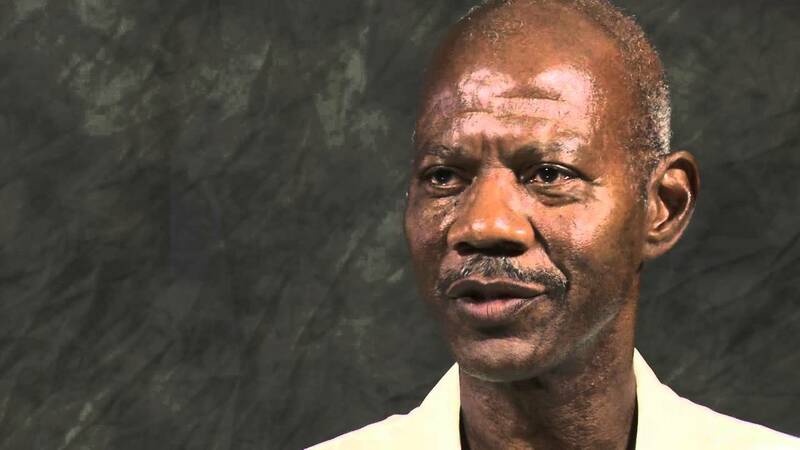 You had to be careful, said James Jackson, who was captured and beaten by the Ku Klux Klan. Jackson knew many of the Klansmen by sight. He’d see them going about their business during the day, on the streets downtown. 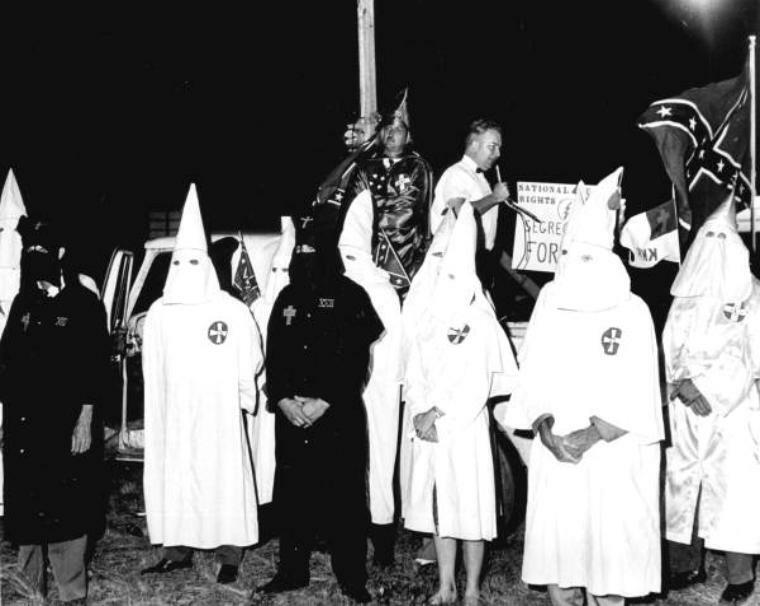 And as the Civil Rights Act moved through Congress, the Klan rallied, openly, on St. Augustine’s quaint downtown streets, in robes that exposed their faces for all to see. Houses were firebombed. Grenades were thrown at juke joints. Shots were fired. One white man, with a loaded shotgun on his lap, was shot and killed as the car he was in cruised through a black neighborhood one night. In his death convulsion, he fired shots of his own through the floor of the car. Young blacks from St. Augustine picketed outside stores, sat at lunch counters where they could not be served. And they marched through the city’s streets, past churches that would not admit them. Demonstrators were threatened and beaten. They were arrested and jailed for attempting to integrate the beaches, lunch counters, hotels. Many of the black demonstrators were trained in nonviolent ways of protesting and pledged to never strike back. Others made it clear that they were armed and would defend themselves, their families and their community if called to do so. Conway says two things united the young black demonstrators: They were fed up with the status quo, where they were permanent second-class citizens. And they were inspired by the civil-rights struggles elsewhere. Why not St. Augustine too? At 12, Conway had a white friend, a fellow paperboy, and when they each ordered milk shakes at the lunch counter at the McCrory’s store, he couldn’t understand why the woman there let his friend eat inside, but insisted he go outside. His friend joined him on the sidewalk. “She’s a mean lady,” he said. At 14, Conway was mowing the lawn of a white woman who offered him a sandwich and a drink. She left it for him on her garage floor, next to the dog’s bowl. As a child, he’d been naive. But now his eyes were open — and he chafed as he saw how his parents had to call white people “Mister” or “Miss,” while they were simply called by their first names, George and Julia. So he was ready, at 14, to join the Movement. That’s what he and his friends called it. Conway recalled that black teenagers would go the swimming pool at Florida Memorial College, a black Baptist school that moved to Miami a few years later. College students would tell the teenagers about the Movement. They’d talk about what was happening around the South, about why action was needed in St. Augustine. By 1964, the Movement drew Martin Luther King Jr. and other prominent black leaders to the city. It drew the support of many white college students from elsewhere, who were beaten and threatened alongside the young black demonstrators. It drew the support of rabbis and priests and nuns and 72-year-old Mary Elizabeth Peabody, mother of the governor of Massachusetts, who was jailed after supporting the demonstrators. And it drew national and international coverage to a tourist city preparing for its 400th anniversary. Tourists stayed away. In 1965, a state legislative report on the unpleasantness in St. Augustine would note that the city lost $5 million in tourism, which meant the state lost taxes, too. “Which means that all citizens of Florida indirectly paid for Martin Luther King’s visitation to America’s oldest city,” the report said, before fretting about the “devastating barrage of unfavorable publicity” from “purported” news accounts. Maude Burroughs Jackson knew unfairness as she grew up in the small black community of Hill Top in Middleburg. Still, she was relatively sheltered, there in the country. She came to St. Augustine in 1960 to go to Florida Memorial College. The city, she said, felt hostile. Discrimination was open. She got involved in the Movement after going to Hayling’s dental office with a toothache. She went to wade-ins at segregated beaches, and between classes she sat at lunch counters or picketed. She was jailed three times. James Jackson said he tries to find the humor in every situation. So he laughs, still, about the night the Ku Klux Klan caught him, Hayling and two other black men, James Hauser and Clyde Jenkins. Jackson and his companions had gone to eavesdrop on a Klan rally that drew hundreds to St. Augustine, and figured they could spy safely from a back road. That was almost a fatal error. They were beaten, severely. Jackson shows off a scar on his forehead, courtesy of a lug wrench. And the Klansmen paid particular attention, he said, to the hands of Hayling, a dentist: How could he practice his profession with broken hands? “We were lucky as hell to get out of their with out lives,” Jackson said. The story he heard later was that a preacher in the crowd sneaked away to alert police. Sometime later, an officer walked up to the rally. “He said, ‘All right, that’s enough,’” Jackson recounted. He took them to the hospital, and then to the sheriff’s office. There, bloodied and bruised, they were charged with assault. After the Civil Rights Act was signed, Jackson remembers coming out of a hardware store and running into Halstead “Hoss” Manucy, one of the prominent white segregationists in town. Manucy had hurled many insults at Jackson, but apparently didn’t recognize him when they bumped into each other. Dawson graduated from R.J. Murray High School just a few weeks before the Civil Rights Act was passed. But he was already a civil-rights veteran; he was arrested nine times and spent at least 90 days in jail. So within a day or two of the act’s passage, he and three other black teens went to a barbecue place on U.S. 1 to “test” the bill. They squeezed their car into a tight space at the front door. As they approached the door, a group of 25 to 30 men and women came from behind the building, almost as if they were waiting for them. They had bricks and beer bottles and baseball bats — “their own little personal weapons,” Dawson said. Frustrated, the mob returned to their truck. Perhaps 15 minutes later, Dawson came out of the woods and saw the truck approaching, with people crowded into the back of it — still looking for him. He ran back in the woods, hiding there for more than two hours. Finally, he crept out and saw a highway patrol car parked in front of another restaurant. Now, he thought, he would be safe. Dawson’s shirt and tie were filthy, his best pants were muddy and his good shoes were caked with mud. He said he needed to talk to the trooper, who sat, just a few feet away, ignoring him. “He’s eating lunch,” the manager said. Dawson insisted. Eventually the trooper got up, locked Dawson in his car, and resumed his meal. As he ate, a crowd of whites assembled around the car, rocking it back and forth, pounding on the windshield, calling Dawson names. The trooper, frustrated, came out, started the engine, and got on the radio. “I found the n—– y’all are looking for,” he said. At the station, they took Dawson’s mug shot, took his fingerprints, but eventually didn’t charge him. The trooper then took him to the headquarters of the Movement, where Dawson’s disappearance was big news. King spoke that night at a church, and invited Dawson to sit with him at the pulpit. So he did, still in his filthy clothes. Dawson ended up traveling the world as a civil servant for the Navy, working on aircraft carriers — a life that would have seemed impossible to him as a teenager. Before things changed, he might have been a cook or a yard man. If lucky, he could perhaps have been a brick mason or a plumber’s helper. The struggle was worth it, he said, although when he returns to his hometown, the past sometimes feels far too close. Views from the Edge Note: Click HERE for hour-long Library of Congress interview with Purcell Conway. Some of the louvered glass windows on the back porch are broken out. Sheets and blankets cover the windows. Time has a way of placing brackets around even the best historic moments. James, Hattie, and Samuel, their 14 year-old son, who was sent to reform school for sitting in at the downtown St. Augustine Woolworth’s, have been borne away by time. The three of them are deceased; their story and the dream is still alive. When young Samuel and his three friends later known as “the St. Augustine Four” were arrested at Woolworth’s, the authorities agreed to release them to their parents’ custody on one condition: that they sign a statement that their children would not violate the law again. The four young men pleaded with their parents not to sign the pledge, assuring their parents that they, the sons, could make no such pledge. Mr. and Mrs. White refused to sign. Fourteen year-old Samuel was sent to reform school for a year. 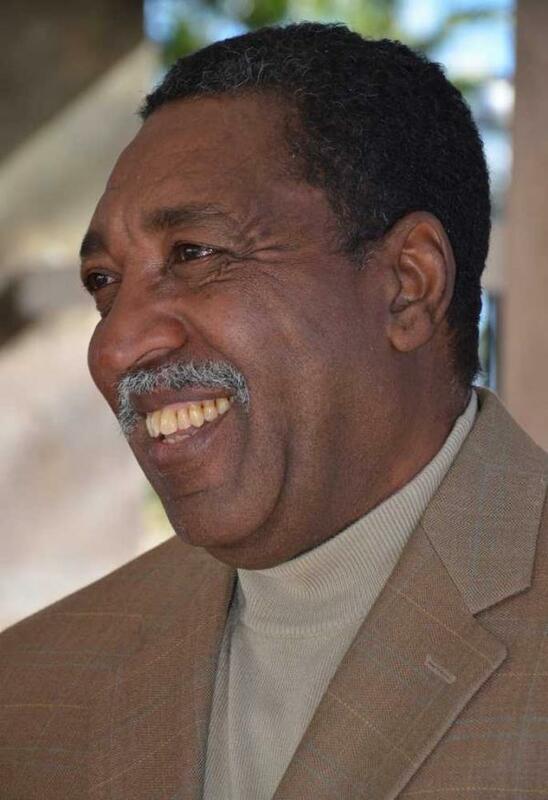 He served six months of the sentence before Dr. Martin Luther King, Jr., Jackie Robinson and other civil rights movement leaders came to St. Augustine to shine the national spotlight on St. Augustine. Samuel and the other incarcerated member of The St. Augustine Four were released by order of the Governor of Florida. The Civil Rights Act followed. We knew nothing about St.Augustine when we rented the house at 96 South Street for the month of January. It turns out that the house next door played an important part in the Civil Rights Movement. 94 South Street is on “The Freedom Trail” tour in St. Augustine in Lincolnville, the district settled by freed slaves in 1866. Newly arrived, we notice that a group gathers each day outside the house. Our second evening I walk by the house at dusk and greet the gray-bearded man sitting in a chair. He rises with his cane. “You live here?” I ask. “My name’s Gordon,” I say, extending my hand. 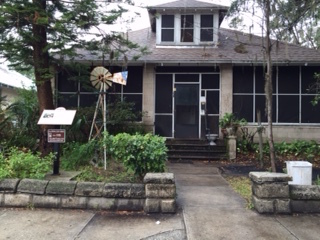 This has been the home to the Whites, one of the outstanding families active in the 1963-1964 civil rights movement in St. Augustine. Parents James (a decorated Buffalo Soldier from World War II) and Hattie Lee White both took part in demonstrations and went to jail for freedom in those times. Their son Samuel was one of the “St. 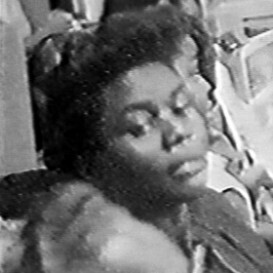 Augustine Four”–teenagers who spent six months in jail and reform school after a July 1963 sit-in at the Woolworth’s lunch counter downtown. Mrs. White wrote to NAACP leader Roy Wilkins, “I’ve never heard of any child being taken away from their parents for wanting his freedom. Have you?” National protests at the injustice by Jackie Robinson and others forced the governor and cabinet of Florida to release the St. Augustine Four in January 1964. Sons Christopher and Walter Eugene were pioneers in the effort to end racial segregation in St. Augustine’s public schools. Son James took part in the wade-ins that garnered international attention at St. Augustine Beach in the summer of 1964. This marker is erected by ACCORD to honor all of the members of the family for their efforts to make St. Augustine, America, and the world a better place. Christopher still lives in the house. So here we are vacationing next to history. Look for more posts from conversations with Christopher and the people at St. Paul A.M.E. Church after the “Hands Up” workshop this Saturday. 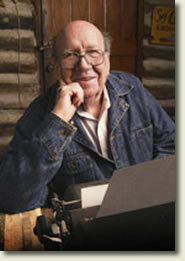 Will Campbell (1924-2013) is unforgettable. Beyond unusual, he was idiosyncratic. In death, he calls us to the deeper selves we so easily lose. Will Campbell was that rare person of integrity who seemed to fulfill the hard calling described once by his friend William Stringfellow – “to be the same person everywhere all the time” – and his different places still blow the mind. He was idiosyncratic. Who else would or could march at the forefront of the Civil Rights Movement in the 1950s and ‘60s, once the law was changed, turn his ministry to sipping whiskey with the Good Ol’ Boys on the front porches of the Ku Klux Klan? Campbell was a son of the Deep South, a white Southern Baptist preacher raised in Mississippi, who betrayed his white privilege as a matter of Gospel discipleship. He became one of the closest friends of the youth Rev. Dr. Martin Luther King, Jr., the only white person present at the founding of the Southern Christian Leadership Conference that led the charge for Civil Rights in America. He was trusted that much. His life was threatened repeatedly. He gained national prominence as a field worker for the Department of Racial and Cultural Relations of the National Council of Churches, the nation’s largest ecumenical council that suffered heavy criticism from anti-civil rights forces across the country, but especially in the Deep South. The National Council of Churches and Will Campbell were to their critics what the KKK was to those who worked to eliminate segregation in America. When the nine black school children walked through hostile crowds to integrate the public school system in Little Rock, Arkansas, Will Campbell was one of four people at their side. He became Director of the Committee of Southern Churchman, a position he used to promote racial reconciliation, his vocation until the day he died. With the passage of the Civil Right Act, the man who spent his ministry to help win freedom for blacks did something no one could have imagined. He chose to re-direct his ministry to the new lepers of society, the defeated hooded enemies of integration, the Ku Klux Klan. Will Campbell was not a hater. He was a reconciler who loved people. All kinds and conditions of people, even his ‘enemies’. He was the same person everywhere all the time. He confused his critics – first the Right and then the Left – by insisting that his soul did not belong to any team – racial, political, religious, cultural. It belonged to the Kingdom of God. There was only one team, and that was the family of ALL God’s children everywhere. Compassion came first in his hierarchy of values. Compassion led him to campaign for justice in the Civil Rights Movement, and compassion led him to sip whiskey with the cross-burners in the rocking chairs on their front porches. His was a ministry of reconciliation, a living, idiosyncratic expression a bold declaration of the biblical gospel that God was in Christ reconciling the world to God’s own Self. The notice of Will’s death (June 3, 2013) at the age of 88 in Nashville, Tennessee reminded me of just how hard it is to be a disciple of Jesus, how hard it is to love my neighbor as myself, especially when the neighbor is the enemy of my own claims to righteousness. Would that all of us were as idiosyncratic as Will. Last night I sang the refrain of this song to a dying woman. I sang it softly, followed by “Swing low, sweet chariot.” Her breathing became calmer. She raised an eyebrow. Earlier in the day a Roman Catholic friend poured out her heart about the state of the church and her hopes that the Spirit that refreshed the Church in the Second Vatican Council will breathe fresh air into the conclave to select the successor to Benedict XVI. She was bemoaning the loss of respect for the right of conscience. I thought of Rosa Parks sitting alone in the front of the bus, changing the world, one woman at the time. All afternoon “Ain’t gonna let nobody turn me ’round” kept playing in my head. It bubbled up from deep in my soul. Five hours later, after years of walking, the chariot swung low. Rest in Peace.